Reusable grocery bags are gaining in popularity even in areas that do not have single-use plastic bag bans or fees. The most commonly cited reason for going reusable is the environmental perks, or rather, by not using disposable plastic bags shoppers are able to minimize the harm caused by plastic bags. Many grocery store retailers are now working to get reusable grocery bags into their customer’s hands for both environmental and economic reasons. Reusable shopping bags replace the need for disposable plastic bags, and they also reduce all of the harm plastic bags cause. Plastic bags are made from non-renewable resources, so once these materials are used they’re gone. To be fair we are not in danger of running out of these resources anytime soon, but there is a limited supply available and it would be wise to regulate how we use non-renewable resources. Plastic bags are recyclable, but unfortunately recycling rates are alarmingly low. The majority of disposable plastic bags end up in landfills or as litter. Plastic is not biodegradable, so it’s here to stay. Plastic litter is a health risk to animals and their habitats and is responsible for the deaths of thousands and possibly millions of animals each year. When exposed to sunlight for an extended period of time, or if tossed around in the ocean, plastic will break down into smaller and smaller fragments. Research has shown tiny plastic pieces in different animals, such as plankton. Between the use of resources and the resulting environmental harm plastic is just not worth it. Disposable plastic bags cost retailers money. The expense of these bags is passed along to customers, but when shoppers bring their own bags that reduces the need, and the resulting cost of purchasing plastic bags. Some stores even offer shoppers a discount if they bring their own reusable bags. It may be a few cents per bag used, but that adds up and oftentimes it may simply offset the cost of disposable bags, so the store is not losing money, but the customer saves money and this can establish loyalty. Consumers like to support likeminded businesses, and environmental issues are a cause a lot of people can get behind. 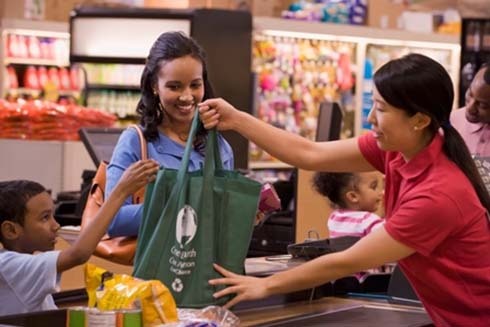 When a retailer supports the environment by encouraging customers to bring their own bags, that can help establish a rapport between the customer and the brand. Some stores are taking things even further by selling branded reusable grocery bags. This really boosts the retailer’s bottom line since they are selling the item, but they are also getting their branding out there in front of their customers and even potential customers. Reusable shopping bags offer an impressive return of investment and are proven to increase brand awareness and recognition. Do you use reusable shopping bags when you shop or when you market your brand? Are you thinking about promoting your brand with reusable bags? If you have questions or need more info let us know by filling out a product quote request or getting in touch here and we can help you out! Next Next post: Are Bag Bans The Best Solution to The Plastic Bag Problem? Why Not Recycle? Recycling is In Trouble. Here Is What Your Community Can Do!